Total retail sales from J Sainsbury plc have been reported as down by 0.4%, and like-for-like sales decreasing by 1.1%. General Merchandise sales, which includes Argos, declined by 2.3%. 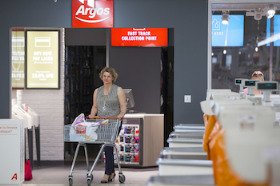 The supermarket chain took over catalogue retailer Argos as well as Habitat in 2016 in a £1.4 billion deal, and although Argos initially was a strong anchor for Sainsbury's with group sales at £29,112m, up 12.7% “mainly as a result of the Argos contribution”, profits have steadily declined which Sainsbury's has been linked to "cautious customer spending". Group chief executive of J Sainsbury plc, Mike Coupe said: "Christmas came late this year and I am pleased with the excellent service and availability that we gave customers across the Group. Sainsbury's stores were well set up to deal with customers doing their big Christmas shops later than usual and Convenience stores hit a new record on Christmas Eve. Argos Fast Track offers customers market-leading delivery and grew strongly in the quarter. Although to cater for the huge uplift in demand on its busiest day, in the last few weeks of Christmas, the retailer had added 100 extra Argos collection points in Sainsbury's stores and opened 14 more Argos stores inside Sainsbury’s supermarkets. However "sales declined in the quarter due to cautious customer spending and our decision to reduce promotional activity across Black Friday." "Retail markets are highly competitive and very promotional and the consumer outlook continues to be uncertain. However, we are well placed to navigate the external environment and remain focused on delivering our strategy," Mr Coupe concluded.